When it was released in 2010, the iPad was labeled as “a large iPod touch” and predicted to be a market failure by many (including a younger, more naïve version of myself). As it turns out, the fact that it is a large iPod touch is precisely what makes it so darn awesome, especially for non-tech-savvy people like my mother. Yes, it has its limitations: the usual restrictions from Apple and the fact that creating content on the iPad is a bit of a chore but, when it comes to consuming content in the form of browsing the internet, online social networking, watching videos, listening to music etc. the iPad, in my humble opinion, offers a user-experience equal to, if not better than, traditional computing devices. When your average Joe wants a tablet, they don’t say they want a tablet, they say they want “One of them iPad things everyone’s talking about”. Now, the 9.7” iPad 2 and iPad 2012 have a majority share of the ever-growing tablet market. However, this share is – according to the latest statistics – slowly decreasing due to the rise of cheaper and smaller Android-based tablets. Apple is reportedly looking to launch a smaller iPad – dubbed as the iPad mini – later this year to rival tablets like the Kindle Fire and Galaxy Tab 2. 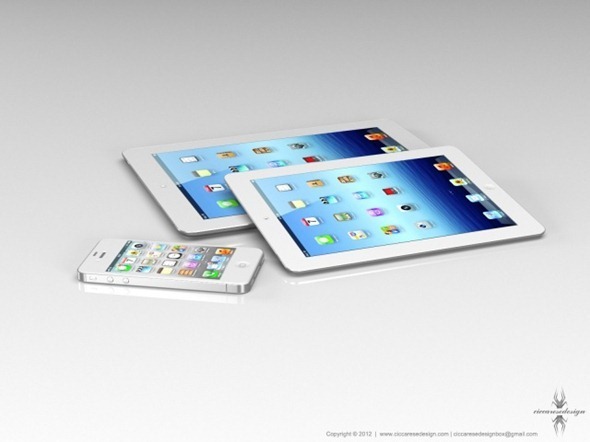 Earlier today, we came across a gallery of renders which give a glimpse of what the iPad mini will look like. Apple likes to maintain a consistent look throughout its product lineup so we don’t expect the iPad mini to look much different from the 9.7” iPad 2012. This is exactly what these images portray: the iPad we are all familiar with, only smaller in size with a 7.85-inch display. 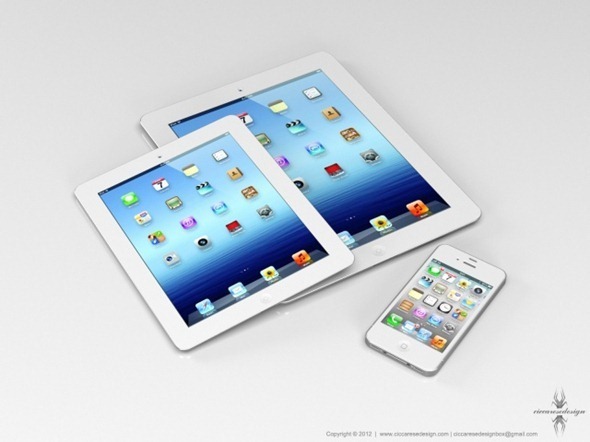 This smaller iPad has been placed alongside a 9.7” iPad and a 3.5” iPhone 4S to give users a sense of its size. 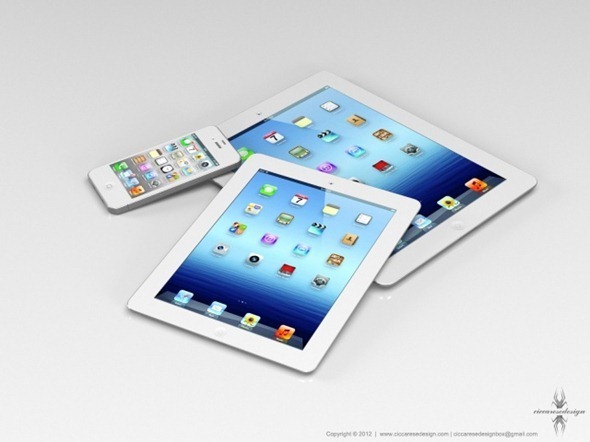 According to rumors and reports, the iPad mini will be based on the iPad 2 chassis. So that means you’ll get a dual-core chip and a smaller, more crisp 1024×768 display. The more important specification, though, will be the device’s price-point. If Apple can manage to sell its lowest-end version (8 or 16GB WiFi-only) at $299, it will be pretty difficult to ignore it when placed next to the $199 Kindle Fire and the $249 Galaxy Tab 2. What are your thoughts about the iPad mini? Do you like the current size of the iPad display? Don’t? Sound off in the comments section over on our Facebook and Google+ page!